Back L to R: Padraig Earls, Conor Quinlan, Brian Concannon, Oisin Coyle, David Skehill, Tomas Hoban, Conor Daly, Conor Gardiner, Padraig Daly, Evan Curley, Patrick Monaghan, Keith Hardiman, Daniel Lally. Front L to R: Iomar Creaven, Dean Earls, Clement Earls, Cathal Kelly, Paul Hoban, Andrew Daly, David Concannon, Cathal Keane, John Mc Donagh, Shane Concannon Paul Kennedy. 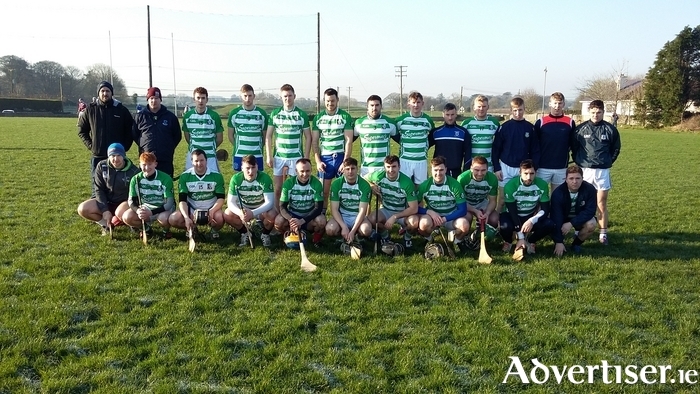 Supermac's were crowned junior hurling interferm champions after a last-gasp victory over Athenry Industries in St Mary's Raheen on Saturday. Trailing by a point in injury time, Conor Gardiner finished a David Concannon free to the net to claim the title for the first timeby 3-11 to 0-18. Supermac's struck three goals, while Athenry, having produced an excellent hour of hurling, suffered heartbreak for the second year in succession. They were on top for the majority of the match, but the concession of goals at crucial stages was the key to Supermac's success. Both sides exchanged early points in a lively opening. Brian and David Concannon were on target for Supermac's, while Michael Morris and Donal Barry pointed for Athenry. Clement Earls stuck Supermac's first goal on 11 minutes when his effort just crossed the line despite the best efforts of the Athenry rearguard, and Cathal Keane stretched Supermac's lead to four moments later. However Athenry kept in touch. Niall Morrissey, with two pointed frees, reduced the arrears to two after 18 minutes before Brian Concannon (Supermac's ) and Enda Concannon exchanged points. Athenry finished the half the stronger, levelling the contest entering injury time with two more Niall Morrissey frees. They could have gone further ahead when Michael Morris was impeded, but Morrissey’s penalty was well saved by Padraig Daly. Instead they settled for the resultant 65’ to leave Athenry 0-9 to 1-5 ahead at the break. Athenry restarted with another Morrissey free and a fine Ronan Hardiman point to stretch their advantage to three, but crucially Supermac's responded with a second goal after Conor Gardiner set up Clement Earls. Once again Athenry replied, and points from Michael Morris and a long-range Keith Kennedy free to nose in front, but it was nip and tuck all the way. A David Concannon free reduced the advantage before a fine score from Ronan Hardiman and another Morrissey free put Athenry three clear entering the final quarter. However Supermac's worked hard with points from Conor Gardiner and Brian Concannon before a David Concannon free had them level with just five minutes remaining. Substitute Jamie Holland pointed, but it was cancelled by a David Concannon free, and with extra time beckoning, Cathal Keane, with a fine solo effort, edged Supermac's in front with time running out. Athenry again responded through Morrissey who fired over another free from distance and his ninth point. Although David Concannon was off target for Supermac's, they carved one final chance. Another Concannon free appeared to be drifting wide, Conor Gardiner latched on to the ball to rifle home and wrap up the title for Supermac's, who will now face H&MV Engineering from Limerick in the All Ireland semi-final. Supermac's: P Daly, D Earls, C Daly, C Kelly, D Skehill, P Hoban, A Daly, O Coyle, C Earls(2-0 ), C Gardiner(1-1 ), T Hoban(0-1 ), C Keane (0-2 ), B Concannon (0-3, 1f ), J McDonagh, D Concannon (0-4, 3f ). Subs, I Creaven, S Concannon, D Lally, K Hardiman, P Kearney, P Monaghan. Athenry Industries: D Gilligan, S Burke, D Glynn, J Coen, I O Shea, K Kennedy (0-2, 2f ), D Joyce, M Hannon, D Barry (0-1 ), R Hardiman (0-2 ), S Kelly, M Morris (0-2 ), N Morrissey (0-9, 8f, 1 65’ ), E Concannon (0-1 ), J Grealish. Subs, D OHalloran, J Holland (0-1 ), J Concannon. Referee: John Keane (Rahoon ).